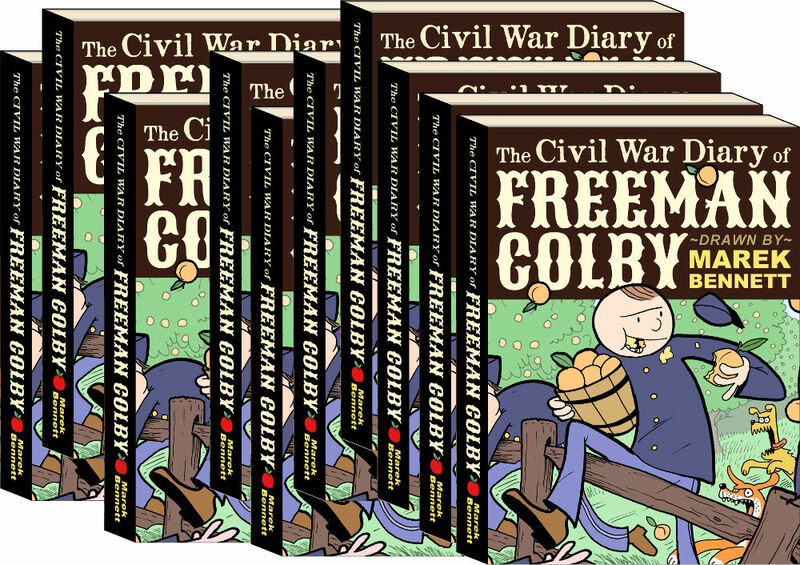 Colby 1: When the War Broke Out - 1861: Freeman Colby (of Henniker) needs a break from the rigors of teaching… so he enlists to fight in the Civil War! Colby 4: Newton, My Brother - 1862: Freeman Colby's little brother can't wait to go to war! Colby 7: Just in Case - 1862: You're in the army now. Colby 11: Captain’s Promise - 1862: Is Captain Richardson playing favorites in the furlough department? Colby 13: Devoted to Drilling - 1862: This seems almost idyllic... until you consider the horrors these men will soon face. Colby 15: Evasion - 1862: Two soldiers on the run skip Boston, evade arrest, and proceed straight to NH! Colby 39: And a Vigilant Lookout - 1862: Rebels on the far bank! Colby 50: Teamwork - 1862: With a little teamwork and vigilance, a squad of Union soldiers can accomplish an astonishing amount of... card-playing?! Colby 69: Treatment - 1862: The regimental surgeon is an expert ... in foiling fakers! Colby 71: The Yallers - 1862: And now we have a diagnosis! Colby 77: Regimental Sutler - 1862: Sutler Pullen provides the goods... IF you have the money! Colby 84: Offutt’s Crossroads - Colby enjoys the lovely fall weather ... for a little while. Colby 89: Knife - Colby's father sends him a knife in his holiday box, but will it get past Capt. Richardson? Colby 98: Quick Note - News from Newton! Colby 100: Warm Weather - Enjoy it while it lasts, and send home for treats! Colby 114: Weak and Sick but Happy to be Home - 1863: Finally, a letter arrives -- brother Newton has made it back to New Hampshire! Historical New Hampshire Vol. 71 No. 1 - Featuring "Drawing Freeman Colby," an 18-page full-color article about the "Live Free & Draw" comics creation process. Freeman Colby Vol. 2, Episode 1: New Year’s Day, 1863 - January, 1863: Writing home while on picket duty.